These chocolate and oat bars have an oat-crumbcrust which is topped with sweetened condensed milk, nuts andchocolate chips and a crumb topping. Preheat oven to 350°F (175°C).Lightly grease a 13 x 9 x 2-inch baking pan; set aside. 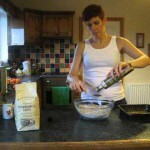 In large mixing bowl, combine flour, oats,sugar and butter, mixing well. Reserve 1/2 cup oat mixture. Press remaining oat mixture onto bottomof prepared baking pan. Bake for 10 minutes. 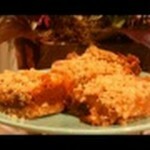 Pour sweetened condensed milk evenlyover crust. Sprinkle with nuts and chocolate chips. Top with reserved oat mixture; press downfirmly. Bake for 25 to 30 minutes or until lightlybrowned. Cool. Cut into bars. Store covered at room temperature. 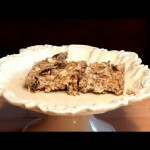 If the Chocolate ‘n’ OatBars recipe was useful and interesting, you can share it with your friends or leave a comment.